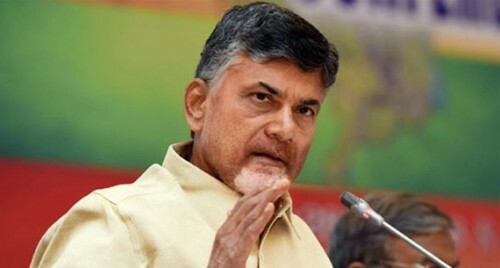 Amaravati, April 12 (IANS) A day after polling in Andhra Pradesh, which was marred by the malfunctioning of some EVMs, Chief Minister and TDP President N. Chandrababu Naidu on Friday blasted the Election Commission for what he called "turning the elections into a big farce". Declaring war on the poll panel, Naidu said its insistence on use of a non-reliable technology, refusal to count VVPAT slips, transfer of officials and its other moves at the behest of Prime Minister Narendra Modi raised serious questions over its credibility. At a news conference, the Telugu Desam Party (TDP) chief said that he had never seen such an insensitive, irresponsible and useless Election Commission. He said he was ready to go to any extent in his struggle to save democracy, which he said, was being endangered by relying on Electronic Voting Machines (EVMs) which can be manipulated. Accusing the EC of bias, Naidu wondered why democracy should be at the mercy of machines. Claiming that 35 per cent of the EVMs malfunctioned during the polling in the state on Thursday, Naidu said the voters had to suffer as some of them waited till the early hours of Friday to cast their votes. "Polling at many booths started at 1 p.m. and ended at 6 p.m. Some people voted at 3.30 a.m. Do you have commitment towards the country. Do you care for democracy vote. The Election Commission should answer." He took strong exception to Deputy Election Commissioner Umesh Sinha calling the EVM malfunctioning a small issue and said at one stage 4,600 EVMs were not functioning. "Your own CEO (Chief Electoral Officer) could not vote. What about the common man. What do you say about this," Naidu asked. The TDP leader also questioned the EC about the qualification and credibility of technicians it recruited to repair the EVMs. "Who are these people? How were they recruited. What is the guarantee that these people are not doing any manipulation in the EVMs," he asked. Naidu said since the EVMs are 'manageable' and can be tampered with, 22 parties had urged the EC to revert to the system of paper ballot to bring transparency in the system. When the poll panel ruled this out, they demanded counting of all Voter Verifiable Paper Audit Trail (VVPAT) slips. Naidu said he would visit Delhi on Saturday for filing a review petition in the Supreme Court for counting of at least 25 per cent of the VVPAT slips. He slammed the EC for holding the elections in Andhra Pradesh in the first phase. "Last time, the elections were held in the last phase and this time in the first phase. What is the logic behind it. Did you have a jumbling system or a lottery system or did you consult the parties. What it indicates. You did it because, Modi wanted this," he said. Naidu came down heavily on the poll panel for the transfer of officials including the Chief Secretary and alleged that it was all done to favour the YSR Congress Party. He reiterated that the EC shunted out the Kadapa Superintendent of Police as he was probing the murder of Y.S. Vivekananda Reddy, the uncle of YSRCP chief Y.S. Jagan Mohan Reddy. He pointed out that Vivekananda Reddy was murdered at home and the evidence on the crime was erased. "You did what the criminals wanted. Where will be the law and order," he asked alleging that the poll violence was pre-planned. He also asked the EC why it failed to give to the state police the IP addresses of those who tried to delete 7 lakh votes under a conspiracy and alleged that the poll panel shielded the criminals.